The 538 Electors of the Electoral College met in their respective state capitals yesterday and easily handed Donald Trump the mantle of Presidency with only 2 GOP electors defecting against him. Here are the results state by state with a breakdown on the numbers. 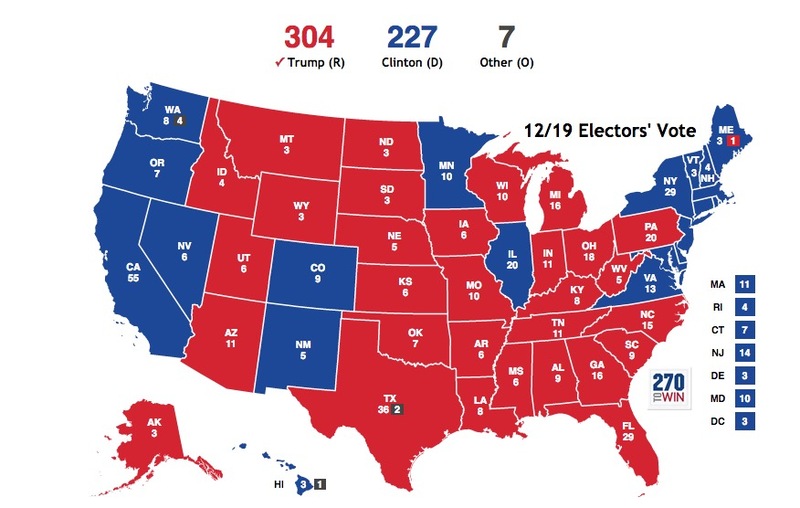 Despite thousands of voters writing Republican electors and trying to convince them to flip against Trump due to Clinton’s winning the popular vote by nearly 3 million votes, chances were very slim that this would actually happen. History tells us that electors typically vote within their state’s guidelines and don’t flip or go faithless. One of the first to be announced was when CBS News in Pittsburgh announced that all 20 of Pennsylvania’s electors have voted for Trump. This is in line with what their state’s popular vote required their electors to do, so it looks like no one in Pennsylvania ended up voting faithless. Pennsylvania was a state that many people were watching because of the recount attempt there and the controversy over a typically blue state turning red. Alabama – All 9 electors have voted for Trump. Alaska – All 3 electors voted for Trump. Arizona – All 11 electors voted for Trump. Arkansas – All 6 electors voted for Trump. California – All 55 voted for Hillary Clinton. Colorado – All 9 electors voted for Clinton, after one attempted to go faithless to try to keep Trump out of office. Connecticut – All 7 electors voted for Hillary Clinton. Delaware – All 3 electors voted for Hillary Clinton. Florida – All 29 electors voted for Trump. Georgia – All 16 electors voted for Trump. Hawaii – 3 voted Democrat and 1 turned faithless and voted for Bernie Sanders instead of Clinton, per 270toWin. Idaho – All 4 electors voted for Trump. Illinois – All 20 electors voted for Clinton. Indiana – All 11 electors voted for Trump. Kansas – All six electors voted for Trump, per 270toWin. Kentucky – All 8 electors voted for Trump. Louisiana – All 8 electors voted for Trump. Maine – Maine and Nebraska are the only states that split their electoral votes. In Maine, Trump earned 1 electoral vote and Clinton earned 3. One of Clinton’s electors, David Bright, announced on Facebook that he was giving his electoral vote to Bernie Sanders. He tried to do just that, but he was ruled out of order and the vote was recast, forcing him to vote for Hillary Clinton instead. Maryland – All 10 electors voted for Hillary Clinton. Michigan – All 16 electors voted for Trump. Minnesota – All 10 electors voted for Clinton. Missouri – All 10 electors voted for Trump. Mississippi – All 6 electors voted for Trump. Montana – All 3 electoral votes went to Trump. Nebraska – All 5 voted for Trump. Nevada – All six voted for Clinton. New Hampshire – All 4 electors voted for Clinton. New Jersey – All 14 electors voted for Clinton, per 270toWin. New Mexico – All 5 electors voted for Clinton. New York – All 29 electors voted for Hillary Clinton. North Carolina – All 15 electors voted for Trump. North Dakota – All 3 electors voted for Trump. Ohio – All 18 electors voted for Trump. Oklahoma – All 7 electors voted for Trump. Oregon – All 7 electors voted for Clinton. Pennsylvania – All 20 votes for Trump (verified by CBS). Rhode Island – All 4 electors voted for Clinton. South Carolina – All 9 electors voted for Trump. South Dakota – All 3 electors voted for Trump. Tennessee – All 11 electors voted for Trump. Texas – In Texas, 36 out of its 38 electoral votes went to Trump. Chris Suprun wrote today on The Hill that he still intended to cast his vote for John Kasich and not Trump. Once the meeting got underway, four electors resigned and then were replaced, which caused the results to be delayed. One of the electors, Sisneros, did not want to vote for Trump. The other three found out they were ineligible, Sean Walsh of the Statesman reported. Utah – All 6 electors voted for Trump, per 270toWin. Vermont – All 3 electors voted for Clinton. Virginia – All 13 electors voted for Clinton, according to 270toWin. Washington – In Washington, eight voted for Clinton, 3 voted for Colin Powell, and 1 voted for Faith Spotted Eagle. West Virginia – All 5 electors voted for Trump. Wisconsin – All 10 electors voted for Donald Trump. Wyoming – All 3 electors voted for Trump, per 270toWin. Even though Billary won the popular vote, she lost yet more votes in the EC. The Democrats are goings to RUE the day that they made this THIEVING POS their queen and savior.? Any chance we can stop the name-calling now that she has been stomped down? Weren’t some electors fined or faced potential fines if they voted a particular way? Some states have laws against being “unfaithful.” In some, there are fines. In some, the elector is just removed. In some, the vote just doesn’t count. I think jail time is possible somewhere. The Founders were all about checks and balances. They tried to find a way to prevent any perversion of their ideal. They also seemed to be dubious about pure democracy. So senators were to be chosen by state legislatures, and the Electoral College was devised to overrule the popular vote, if the rabble voted in a demagogue. No way. Remember she called us a bunch of names… Deplorable??? Btw you still allow your mano to continue the name calling… What a tool. “She” didn’t call YOU anything. Unless you’re identifying with the people she was describing. I have seen her be defeated more then once. I guess it would be “nice” if we let her go her own merry way. But she continues to be in the spotlight, refused to graciously admit defeat, left her supporters crying in a pack auditorium without a care. I wonder what in the world has she done for you to care what a fellow person has to say about her. I sit here and watch people smear our PEOTUS and you don’t bat an eye.